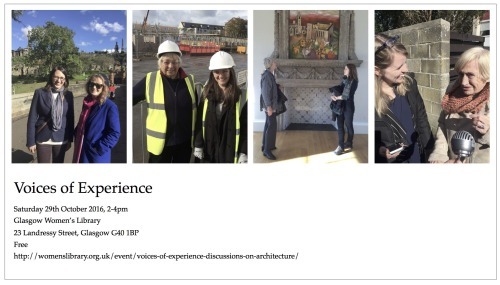 Collective Architecture and EASLA are delighted to be hosting ‘Voices of Experience’ at Glasgow Women’s Library on Saturday 29th October between 2-4pm. ‘Voices of Experience’ forms part of the Glasgow Women’s Library’s 25th Anniversary Autumn Programme and is the start of an on-going audio archive. Please come along to this afternoon event and listen to short, pre-recorded conversations between young and highly experienced architects. During the event, the architects will discuss their work and share their experience of working within Cumbernauld New Town, Glasgow Necropolis, Linlithgow and Edinburgh’s historic centre. Contributors include architect Margaret Richards (formerly of RMJM), conservation architect Fiona Sinclair, architect/historian Dorothy Bell, teacher/architect Anne Duff. They will be joined by Mairi Laverty, Nicola Mclachlan, Cathy Houston and Emma Fairhurst of Collective Architecture. The event will be hosted by Suzanne Ewing, Head of the Edinburgh School of Architecture and Landscape Architecture (ESALA) and Jude Barber of Collective Architecture. Please come to meet the architects, hear more about their experiences and join the conversation. It’s an informal event with tea and cake.